Sofia is a graduate of the Law Faculty of the University of Athens (LL.B. 2014). 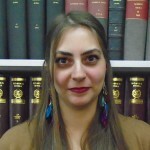 She has also attended courses in International and EU law at the University of Vienna and has pursued internships with international organisations in Vienna, the Hague and Athens. She specialises in Public International Law, International Criminal Law, Human Rights Law, International Economic Law and EU Law. Her recent research interests focus on the regulation of the sharing economy in the EU. SpecialtiesEU Law, Private International Law, International Criminal Law, Human Rights, International Humanitarian Law.